Legionella bacteria can breed in any stagnant water within the 25oC to 45oC temperature range, doubling in number every eight hours. Public health is just as much at risk from Legionella in private homes and offices as it is in large scale public buildings but there are three major factors that create additional risk in healthcare environments. The first is the sheer scale of the plumbing network. The second is the amount of modifications that will take place to the plumbing infrastructure during the service life of a hospital building. The risk factor here is that changes to the layout can create ‘blind ends’ on the infrastructure where stagnant water can collect, creating an ideal environment for Legionella growth. 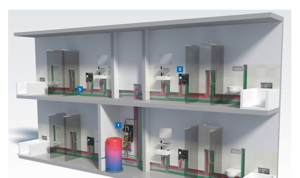 In older hospitals, no clear plan of pipework may exist. The third additional risk factor for hospitals is the demographic of its occupiers. Whereas Legionnaires’ disease often causes cold or flu-like symptoms in healthy people, it can be far more serious for those with vulnerable immune systems due to ill health or pre-existing respiratory conditions. Legionella is addressed by HTM04 (Health Technical Memorandum) guidance, which calls for strict flushing regimes in order to minimise the risk of stagnant water in the pipework. Hospitals must also ensure that taps and sentinel points are regularly checked using thermal probes and that temperatures are recorded so that the hospital is accountable for water consistently reaching 50°C in order to control growth of Legionella. Such regimes are not an infallible defence, however, as even the most closely monitored flushing cannot overcome the vulnerability of dead ends on the network and, like all elements of routine maintenance, flushing regimes are susceptible to human error. There are a number of other sources of guidance and legislation that can contribute to Legionella safety and best practice. The Water Supply (Water Fittings) Regulations 1999, BS EN 806: 2006 (parts 1-6), BS 8558: 2015 and Part G Building Regulations all reference Legionella safety, while both CIBSE design guides and HSE ACOP L8 guidance also give clear best practice on mitigating Legionella risk. However, it remains vitally important to understand the risks and ensure that they are engineered out of plumbing installations as effectively as possible. While many of the factors affecting Legionella risk are associated with older pipework and legacy modifications to the network, contemporary installations designed to reduce consumption can also reduce flow velocities, impeding the effectiveness of flushing regimes. Water efficient fittings can also reduce water demand, resulting reduced flow through the system. This increases the risk of stagnant water, unless the pipe network has been specifically designed to adapt to these reduced flows. Where there has been repeated or consistent stagnant water over time, a biofilm can form. This tacky, chemical treatment-resistant coating increases the Legionella risk by enabling the bacteria to become embedded on the surface and is virtually impossible to remove without replacing the affected section of pipe. Calcium deposits on metalsurfaced pipework can also provide a perfect environment for harbouring Legionella. Pipe specification can remove some of the conditions that support Legionella growth. By switching from copper piping to MLC (multi-layer composite) pipe or PE-X polyethylene pipe, the specifier can significantly reduce the risk of calcification and ensure a smoother internal surface to enable better water flow. Some common joint methods on copper piping can provide small crevices that can harbour biofilms and bacterial growth, whereas MLC and PE-X pipe systems that seal on the inside bore provide a smooth marriage of the pipe and fitting and a more hygienic connection. This simple change can significantly reduce the risk of conditions where Legionella can thrive. It‘s also important to choose the right size of pipe, as this will help to determine flow rates. Correct sizing using short pipe runs and return systems ensure that water is flushed effectively through the system, even where water saving measures have been specified, enabling flushing both through regular use and flushing regimes. For high rise buildings, smaller zoned pressure breaks should also be designed into the installation to ensure consistent flow rates and hot water delivery speeds throughout the building. The configuration of the water and pipework system can ensure elimination of both blind ends and ‘dead legs’ on the network that are seldom used. The traditional ‘Tee’ installation directs water flow specifically and only to the water outlet activated by the user, maximising water pressure, improving speed of delivery of hot water to the point of use and reducing water consumption. But this configuration allows potential dead legs by failing to flush water through any pipework for services that are not in use. Therefore, stagnant water can accumulate, increasing the risk of Legionella. Conversely a ‘serial’ installation can avoid dead legs, provided that the most frequently used water outlet – usually the toilet in a standard a bathroom - is placed as the final item on the network. Where this is the case, water regularly travels through the pipe to reach the frequently used service, flushing away the potential for stagnant water and Legionella in the process. 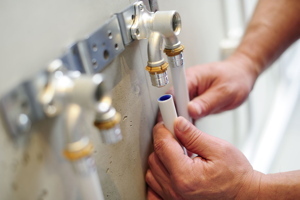 The most effective pipework configuration of all is a ‘loop’ installation. 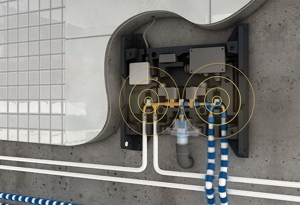 Used commonly in Scandinavia and Germany, a loop installation connects a small set of services and flushes water through the whole local pipe network every time any water outlet on the system is activated, regardless of where the water is used. 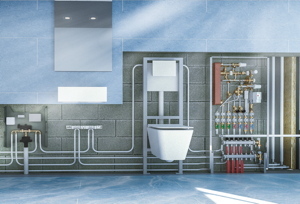 It requires fewer connections and fittings and enables excellent water pressure and speed of hot water delivery, whilst completely eliminating dead legs and enabling specification of a consistent pipe size throughout each local network. Design expertise is vital for safer and more hygienic water services and early engagement with a pipe supplier can help to identify a best fit approach. There should be no ‘dead legs’ on the system and the design should avoid the storage of hot or cold water, as water storage is a potential stagnation hazard. Temperature control and the insulation of pipes, ideally with separate service ducts to prevent heat transference from hot to cold pipes, will also protect the installation from the risk of stagnant water within the 25oC to 45oC optimum conditions for Legionella growth. Legionella will always remain a risk that requires vigilance and monitoring. However, with best practice management regimes and improved installation design and specification the risk can be significantly reduced.